From Gary Barlow’s backing musicians to flags fluttering on the flotilla, the Commonwealth featured prominently in the diamond jubilee celebrations. And when Commonwealth leaders sit down to a special lunch with the Queen later today, there will undoubtedly be much toasting. Yet, behind the pomp and pageantry of the weekend, lies an international association that has had few public political successes in recent years and shows signs of genteel decline. And there’s likely to be little discussion today of how the Commonwealth will add value in the modern diplomatic world. The Commonwealth deserves its role in the jubilee celebrations. Remarkably, the Queen has overseen the independence of no fewer than 43 countries – all of which have chosen to join the Commonwealth despite many becoming republics (only Zimbabwe has since left) – and she has actively promoted this association of equal and independent states. But for those of us who believe in the Commonwealth as a unique international experiment in promoting shared values around democracy, development and human rights, the celebrations have been bittersweet. A growing momentum to reform and revitalise the Commonwealth’s institutions seems to be running out of steam. Ahead of the last Commonwealth heads of government meeting (CHOGM) in Perth, Australia, last October, an eminent persons group came up with a set of recommendations to rebuild the Commonwealth’s profile. Many of their key reforms – such as the creation of a commissioner on democracy, the rule of law and human rights – were kicked into the long grass. Attempts to enshrine shared values in a charter are still being discussed by officials, but the final product is unlikely to go beyond existing international commitments. Some of the Commonwealth’s most enduring successes – its role in ending South African apartheid, for example – arose from creating dialogue between countries with different outlooks who nonetheless managed to agree a way forward. Today, there seems little appetite for tackling some of the thornier issues that should be on the agenda. For example, the Commonwealth could be actively working to end the criminalisation of homosexuality in its member states, or clamping down on the arms trade. And leaders attending today’s lunch need not look far to see perhaps the thorniest issue of all. The Queen will be joined by both Sri Lankan president Mahinda Rajapaksa, whose country will host the next CHOGM, and Canadian prime minister Stephen Harper, who has said that he will not attend CHOGM unless the Sri Lankan government addresses human rights violations. 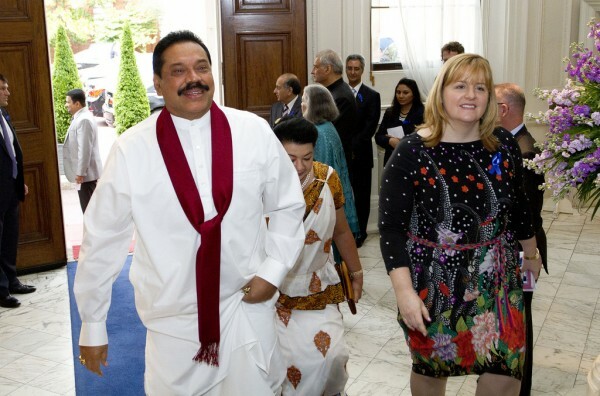 Rajapaksa will rightly claim that his government has received no formal Commonwealth sanction and that he has the backing of the vast majority of member states. Harper’s concerns are shared by several member states and almost all Commonwealth NGOs. The problem is that Commonwealth institutions seem unable to lend a helping hand with reconciliation or development in Sri Lanka, or to be able to demonstrate that they can resolve political differences. Without the former, Sri Lanka and its supporters will see the Commonwealth as just another UN-style forum for punitive resolutions; without the latter, the next CHOGM may be marred by deep faultlines and further scepticism about whether the Commonwealth stands for any shared values.